WEST PALM BEACH, FL (April 2, 2019) – Greg Norman Golf Course Design (GNGCD) – the premier signature golf course design firm in the world – today announced the redesign of famed South Florida resort course, The Diplomat, slated for completion summer 2019. The resort previously known as The Diplomat is currently undergoing a massive rebrand by sbe and PPG Development to continue expansion of the SLS brand in South Florida with SLS Resort Residence & Marina Hallandale Beach. The $220 million project includes the remastering of the old Joe Lee-designed golf course along with a new driving range, short game area and practice putting green. The golf and club operations at the new SLS Resort Residence & Marina Hallandale Beach will be managed by Troon, the world’s largest club management company. GNGCD broke ground in late 2018 and at completion the new resort course will stretch 6,500-yards surrounded by the tropical vegetation native of South Florida including coco palms, sabal palms, gumbo limbo, black olive and massive ficus trees lining the corridors. Greens, tees and bunkers have been designed with a geometric character to create more defined golf features for better strategy and decision-making visual cues, while seamlessly integrating into the natural surrounds. While maintaining existing corridors was an important consideration, the course is completely reimagined with many holes playing in reverse from the previous design. The existing 2nd hole, which is the iconic island green in front of the clubhouse, will be repurposed and modified to play as the par-4 finishing 18th hole. The new design will offer plenty of risk-reward opportunities offering strategy and challenge for skilled players, while providing safer avenues to the hole for the novice golfer. Additionally, significant grading and lake expansion will occur to create a no-net-loss of water storage for the entire site. “I have been a fan of Greg Norman since I was a kid. 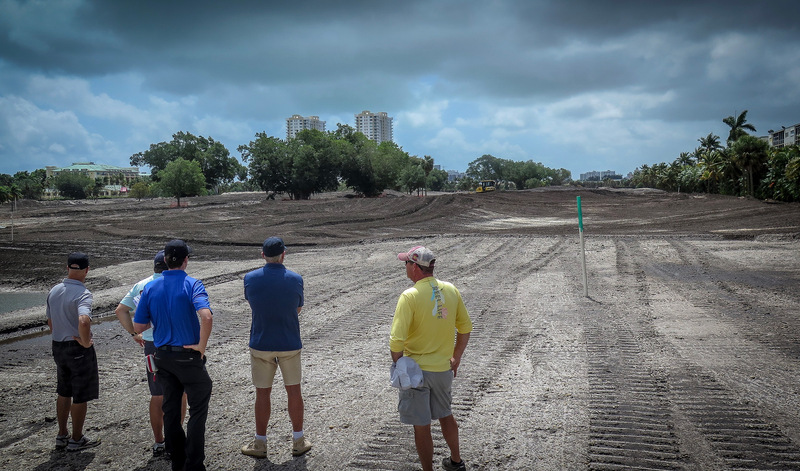 It is a true privilege to be able to work so closely with Greg and his team to be able to create the best golf experience in South Florida,” said Ari Pearl, Principal at PPG Development. SLS Resort Residence & Marina Hallandale Beach will mark the 12th sbe resort and 4th SLS branded property in South Florida. Set to open in 2022, the project will offer 290 hotel rooms including 50 condo/hotel units, 250 branded apartments, and sbe's award-winning Katsuya and S Bar food and beverage concepts. The property will also include sbe's mixology lounge and a 3-meal restaurant concept. GNGCD has opened 105 courses internationally, six of which are included in the 2018-2019 Golf Digest “World’s 100 Greatest” rankings: No. 18 New South Wales G.C. (Australia), No. 31 Ellerston (Australia), No. 35 The Bluffs Ho Tram Strip (Vietnam), No. 82 Jumeirah Golf Estates Earth Course (UAE), No. 94 Danang Golf Club (Vietnam) and No. 98 The National Moonah Course (Australia). The Bluffs Ho Tram jumped an impressive 39 spots from the previous list. Since its inception in 1987, Greg Norman Golf Course Design has been one of Norman’s true passions in both business and life. His experience playing many of the world’s great golf courses over a 25-year career served as a catalyst to develop this interest and turn it into a thriving company. Today, GNGCD courses span the globe, covering six continents and 34 countries. GNGCD’s design philosophy is grounded in a “least disturbance approach” that blends golf courses with their surrounding environment to enhance the properties’ natural features. They are highly-regarded as an industry leaders in promoting sustainability and the compatibility of golf courses with the environment, with many projects having been awarded the coveted Audubon Society Award for environmental stewardship.